This listing is available in Your Choice of Wood or Acrylic Toys. 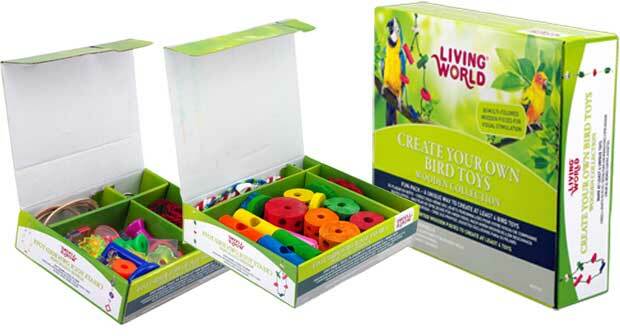 Living World Create Your Own Bird Toys kit contains enough materials to make at least 4 unique bird toys, giving life to your creativity while keeping your bird physically and mentally stimulated. 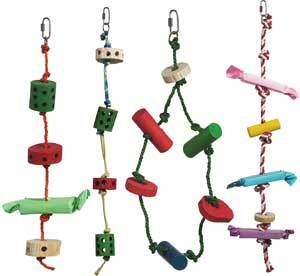 Toys are what will occupy your bird while you are away; they play a critical role in keeping your bird healthy. This kit includes a variety of textures, shapes and colors which will intice interest, encourage play, exercise and help condition your bird's beak. 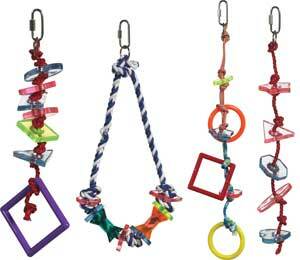 Our toys are designed to keep your bird stimulated by encouraging shredding, chewing and preening. Your bird_s safety is important to us! Your bird may chew, manipulate the toys with their beak, tongue and feet, which is why each piece is safe and made from nontoxic materials. The toy should be located where the bird can easily access it. Suitable for Medium and Large Hookbills. Assorted wooded or acrylic pieces with sisal, cotton covered sisal, leather and/or cotton ropes all in one box allowing you to create your own bird toys and express their creativity.